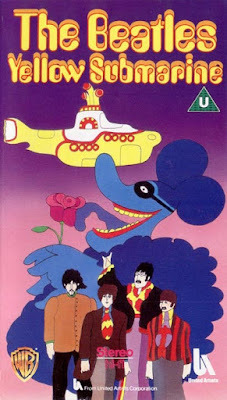 For the upcoming fiftieth anniversary of The Beatles' full length cartoon movie "Yellow Submarine", Apple Corps Ltd is resurrecting an old project which was abandoned earlier - a new comic book adaptation of the film. 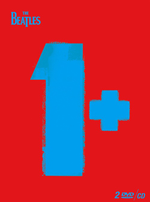 Dark Horse Comics were scheduled to release this new comic book in 1999, but it was aborted after more than half of the book's artwork had been completed. Now it's Titan Comics who are going ahead with the book. The idea came about when the film was being re-released in 1999, as extensive work was done to restore the images, and remix the music and dialogue in stereo as well as in surround sound. To coincide with the film re-release, Apple wanted a new comic book, one that adhered more to the film than was the case with the previous comic book adaptation. Early in 1999, Bill Morrison was approached by Dark Horse Comics, and commissioned to produce the new comic book. The DVD was released in September of ’99, and Morrison remembers the comic adaptation was being timed to coincide with the DVD release, according to a 2006 article over at the comics website CBR.com. The 1968 comic book adaptation. 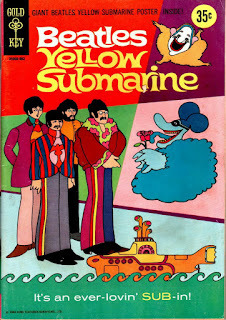 There had been a Yellow Submarine comic published by Gold Key Comics in 1968, produced in advance of the movie. It included passages not found in the film, and character designs made prior to the final designs were okayed for the film. However, the new Dark Horse project was to be a true adaptation of the film. The new comic book was to be one of the various merchandise items to be made available to the public alongside the release of the film on DVD and VHS, together with the Yellow Submarine Songtrack on CD and coloured vinyl, as well as new action figures from McFarlane Toys. Morrison was first approached by Michael Martens at Dark Horse and asked to adapt the script and draw it. The comic book was going to be a full-colour 48 page one-shot (a standalone comic book not part of a series), prestige format. Morrison was contracted to do the entire project and brought in a few of his buddies (from Bongo Comics, where Morrison was employed at the time) to help out. Nathan Kane was colouring the art, and Chris Ungar was handling the lettering. Also, Morrison enlisted his wife, Kayre, to help translate some of the dialogue from VHS copies of the film. Morrison remembers her calling him into her office to listen over and over to bits of dialogue that neither of them could understand because of the poor audio quality and the thick Liverpool accents. One thing to consider when Bill Morrison completes his comic book, is that if he still bases his story and drawings on the 1987 VHS cassette edition of the film, there are going to be discrepancies, as there are in fact two versions of the film. Near the end of the film, the original Sgt. Pepper's Lonely Hearts Club Band are released (thanks to the hole carried in Ringo's pocket from the Sea of Holes) and Ringo rescues Jeremy. The Beatles then have a rematch with the four-headed Meanie dog, singing "Hey Bulldog", with the Beatles victorious once again. That latter scene was shown at the film premiere in England but when the film was released worldwide, the scene was cut out and replaced by a short dynamic battle scene to reach a lower running time. 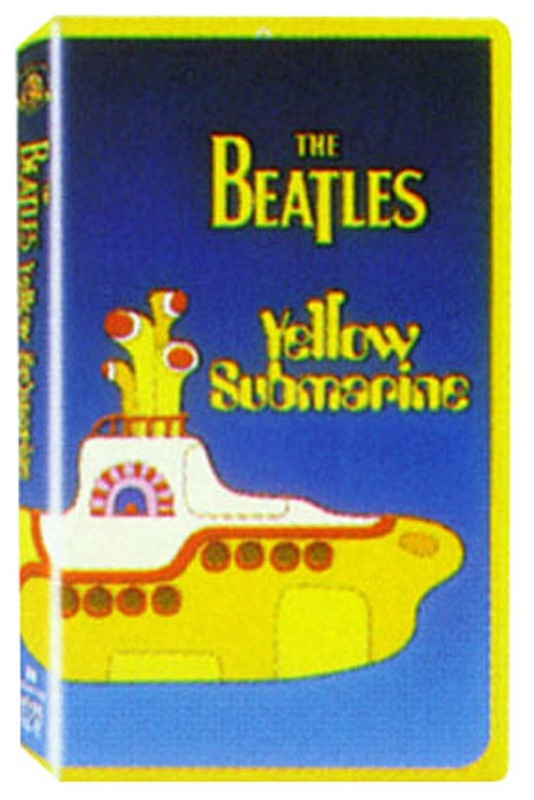 The 1987 video cassette was based on the later print of the film, and had the "Beatles to battle" scene instead of the "Hey Bulldog" scene. The 1999 re-release restored the "Hey Bulldog" scene back into the film. More about those differences here. As he recalls, Morrison was given little input on the direction to take on the project, back in the day. "I remember doing a little sample drawing to see if I had the style down, but I believe that was more for my sake than theirs. In fact, I don’t recall if I ever showed them that drawing. I do remember doing the cover first, because they were going to print it as a poster. Remember when Dark Horse had those promotional newspaper comics that were distributed at comic shops? It was going to be printed full-size on the back of one of those." Sample page in "psychedelic" style, from Morrison's book. "I don’t remember Dark Horse giving me any direction regarding style. It just seemed to be understood that I would be as faithful to the film as possible. I do recall that Dark Horse Publisher Mike Richardson loaned me his personal copy of the original Gold Key Yellow Submarine comic from 1968 for reference. I was excited about doing the first really faithful adaptation of the film. Not to take anything away from the original Gold Key adaptation, but it was obviously done well before the movie was completed. Aspects of the story are different and it’s apparent that the artist (Paul S. Newman, 1924-1999) had only preliminary designs to work from, and some characters hadn’t even been designed yet." "I also found a copy of a Yellow Submarine book with pictures from the film. I really wanted badly to capture the look of the film. 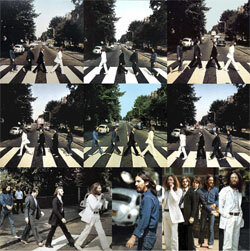 As a Beatles fan myself, I approached it from a fan point of view and tried to bury my own style (whatever that is!)." "As for the design, I thought about the film and how psychedelic it is. I wanted to translate that onto the page beyond just what I depicted in each panel. So I found inspiration in the black light posters I used to cover my bedroom walls with. I designed the opening Pepperland pages very much like psychedelic posters." Regular "basic and dull" panels with Ringo in Liverpool. From Morrison's book. "Then the Liverpool scene with Ringo is pretty basic and dull. But when he and Fred start to assemble the other Beatles one by one, the page design starts getting weird and psychedelic again. I always felt that some of the pages could have had a second life as a black light poster book." "I completed 26 pages, pencil and ink, and I believe Nathan had ten or so pages colored. I think Chris had most of the 26 pages lettered, too," Morrison said. "From what I understand, the executive at Apple Records who oversees the Beatles merchandise had a change of heart. I heard that he only wanted to do really high-class merchandise for this roll out and he suddenly decided that comic books didn’t qualify. He pulled out of the deal and left [Dark Horse Publisher] Mike Richardson holding the bag. And Dark Horse paid me for every bit of my work! He’s a real mensch, that Mike. Another story I heard was that George Harrison felt that because his company was also named Dark Horse, people may think that he was the producer of the comic. If it was bad, he’d get blamed for it. But I think that was just a rumor." Preview from the upcoming comic book, No panels, but circles on this page. Finally, the time has come for Morrison to complete his comic book. The deal between Apple Corps Ltd. and Titan Comics was negotiated by Bravado International, which handles licensing for the Beatles in North America. In addition to the Yellow Submarine comic adaptation, Titan's collectibles arm Titan Merchandise will also be releasing a line of Titans vinyl collectibles based on the movie. 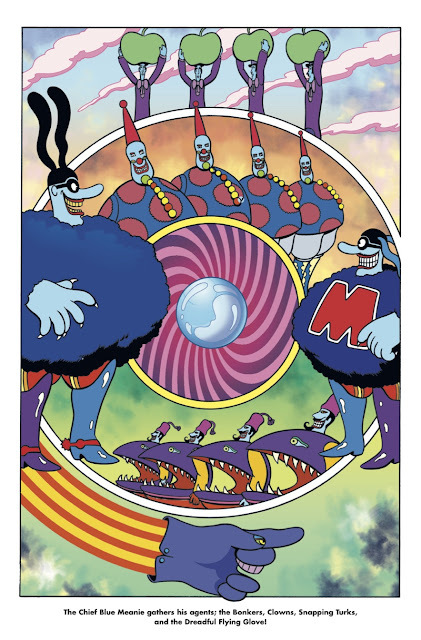 The "All Together Now" collection features two versions of the band, as well as Blue Meanies, the Apple Bonker and the Four-Headed Bulldog, and will hit stores later this month. 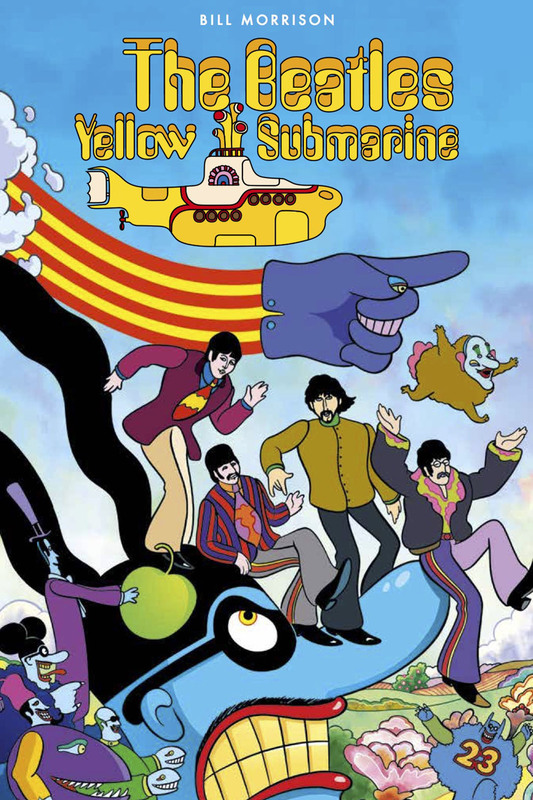 "We’re thrilled to be publishing The Beatles: Yellow Submarine for the 50th Anniversary of this fantastic movie," Chris Teather, publishing director at Titan Comics said. "We can’t wait for Beatles fans to experience this official adaptation." This story puts together text from CBR.com and Hollywood Reporter. An anniversary edition of the film itself is not on the cards, as a 2012 release on Blu-ray as well as DVD still is in the shops. Titan Comics is excited to announce a deal with Apple Corps Ltd to publish an official illustrated adaptation of The Beatles’ iconic animated film, Yellow Submarine. Due to hit stores in 2018 to tie-in with the 50th Anniversary of the release of the movie. 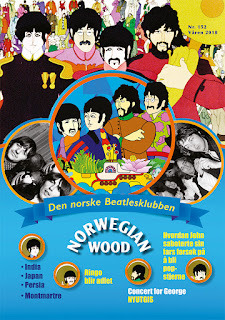 The deal was brokered by Bravado International, The Beatles’ North American licensing agent. 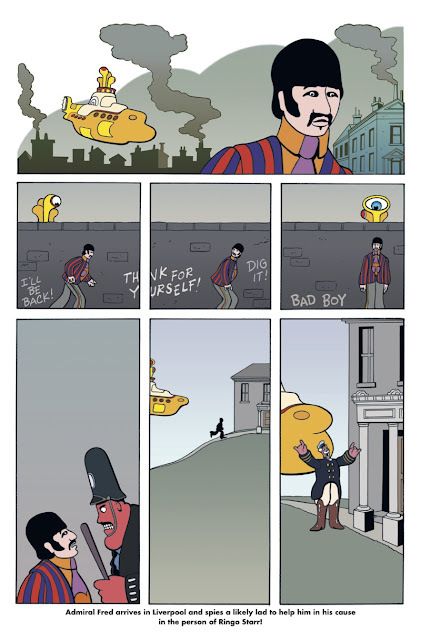 Titan’s official illustrated adaptation of The Beatles: Yellow Submarine is written and illustrated by Bill Morrison – writer and artist from The Simpsons Comics. As a huge fan of The Beatles, this has been a labor of love for Bill, twenty years in the making. 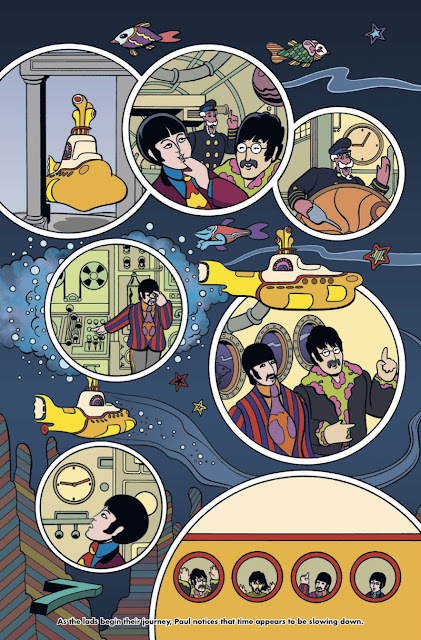 The Beatles: Yellow Submarine Official illustrated adaptation from Titan is due to hit stores in 2018.